Looking for a Yummy Cab Franc? Findleton Winery's 2014 Release Totally Rocks! A truly good Cab Franc is very tough to find. Not many wineries offer it, and many are harsh or just plain blah. But when you get a truly good one, it is worth the wait. Tom Findleton has created such a gem and I was thrilled to be able to taste it back in February. Since then, we have enjoyed several wonderful bottles of this "nectar of the Gods"
Cabernet Franc is one of the major black grape varieties worldwide. It is principally grown for blending with Cabernet Sauvignon and Merlot in the Bordeaux style, but can also be vinified alone, as in the Loire's Chinon. In addition to being used in blends and produced as a varietal in Canada and the United States, it is sometimes made into ice wine in those regions. Cabernet Franc is lighter than Cabernet Sauvignon, making a bright pale red wine that contributes finesse and lends a peppery perfume to blends with more robust grapes. Depending on the growing region and style of wine, additional aromas can include tobacco, raspberry, bell pepper, cassis, and violets. Records of Cabernet Franc in Bordeaux go back to the end of the 18th century, although it was planted in Loire long before that time. 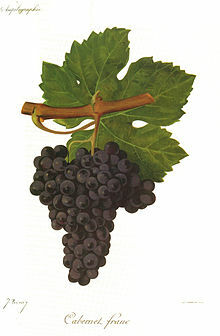 DNA analysis indicates that Cabernet Franc is one of two parents of Cabernet Sauvignon, Merlot, and Carménère. This lovely and fully drinkable wine is acidic in character, with the beautiful softness of a Cab Franc as well as a bold character usually seen more in its close relative; Cabernet Sauvignon. I tasted rich forward fruit, a hint of black pepper, soft vanilla and hot cocoa flavors enriched with some tart strawberry and rhubarb middle tones and a soothing rich dark berry finish that was both lingering and satisfying. I also got just a hint of the type of bell pepper you would find in a Chicago Portillo Italian sub sandwich (thinking of those, as I am making a clone of them tonight for dinner). The color is also dark and rich, with outstanding clarity (no need to decant as no sediment in this wine). There are enough tannins to provide some character with a mild chewy feel, as well as to ensure it will cellar well. We enjoyed this wine with a a pasts smothered with rich Marinara sauce and meatballs. I would expect it to go equally well with salmon dishes, fajitas, grilled chicken based dinner salads, and Italian antipasto plates. And yes, Portillo type Chicago-style Italian sub sandwiches which are NOT low calorie, but a true foodie experience that is not to be missed.